When we lose the eye as the phallus that guarantees the consistency of the visual, the blindness that ensues is not simply a non-signifying darkness, but rather an ‘undifferentiated palate of images.’ The event of an ocular castration gives way to a seething imaginary without the security of a local iconography, and in the desperate attempt to arrest this imaginary deluge a ‘volcanic hunger’ is invoked for the final form of the dead body. In facing the faceless terror of a treacherous cadaver that violently sees me, a transformation can begin to unfold whereby the punishing gaze of the absolute other gives way to the voice of an other who asks ‘what do you want?’, and finally to a desire that neither sees nor is seen, that is free to touch the limit of the visual in a place where nobody is looking. Thanks to Guilherme Massara Rocha for partially hypnotizing us with the incompletely fictional truth of an interrupted analysis. While preparing notes on his case study of a patient suffering from the protracted agony of congenital blindness, “The Secret of Her Eyes: Necessity and Contingency in a Fragment of a Psychoanalytic Treatment,” Guilherme and his wife were strolling through Central Park when they were struck by an impulse to escape the manicured pastoral mirage and explore the helical guts of the Guggenheim Museum. They called on a police officer to spontaneously evoke a projective plane that would map the geometric transition from the primary repression of an elliptical oasis to the historical totality of a skyward spiral, and transpose it into strictly geographical walkable terms. Itching like children desiring to be beamed up to their destination immediately upon hallucinating the contours of their self-fulfilling wishes, they demanded, “How far is it?” As a covert Freudian with a Lacanian tendency toward infinitesimally short sessions, refusing to superimpose a death driven urban grid onto the eros of a park that keeps threatening to engulf its narcissistic center, he answered glibly: “It depends on how fast you walk.” Yet it seems impossible to bridge the gap between geometry and geography, between the length of the stride and the frequency of the step, between duration and the rhythmic nuances that continually interrupt it with percussive insistence. The inexorable urgency and immeasurable singularity of necessary contingencies contribute to their aleatory role in rupturing symptomatic comfort to open us to desire. Guilherme concedes that as an analyst, he can’t bring it on. He can merely supply the sublime ‘profundity of a couch’ as a contingency plan or anamorphic waystation for the weary traveler. A couch that is profound to the extent that it is not what it is, a dent in time as an invitation to explore the synaesthetic fragmentation of the parklessly uncontained. Guilherme furnishes this unseeing couch as a benchmark of unanswerability that sustains time as a spatialized generosity in which a felicitous seeing could emerge from the eyeless void. The function of the analyst is neither more nor less contingently necessary or necessarily contingent than the shrink wrapped perimeter of Central Park. Guilherme’s ‘profound couch’ bulldozes the playing field to produce the ‘anything goes’ of unconstrained permission. Paradoxically this laissez faire ethics gives rise to a paralysis of choice by substituting permission for choice, where choice had substituted for the choicelessness of the necessity of death, as explored by Freud in The Theme of the Three Caskets. The escape hatch from this substitutive progression toward diminished freedom might be to finally substitute time, in the form of the amnesty of the couch of the analytic other, for the timeless rage of a screeching unconscious without the mercy of breath to punctuate the beats. For Guilherme, this would be a time of suspended indeterminacy. In The Theme of the Three Caskets, Freud demonstrates the metallurgical veneers that sustain the falseness of choosing between the contingency of manifest beauty (the gold casket), the ideal of aspirational virtue (the silver casket), and the necessity of death itself (the lead casket). Freud theorizes that the third intervening casket, leaden death, cannot be chosen. And yet it necessitates the pretense of the choosing, while also revealing the inherent morbidity of any false option. Guilherme emphasizes the fact that in the wake of death’s eruption, all that remains is the radicality of a desire rooted in a necessarily indeterminate contingency – the call of death shatters the illusion of choice, takes no predicate, and seeks no answer. To extend Freud’s thinking on this death based economy of choice, I would claim that through analysis, death is further revealed to be the mask of an asking that must come from elsewhere, from a dumb big Other that remains headlessly indifferent to the fish food festivals of little others masquerading as the one, filling fossils with starlight to forge an undying testament to the spasmodic veracity of love at first sight. To return to the walker as a figure for the patient, the footstep inevitably separates from the footprint, leaving us with a fragmentary impression of an over-oedipalized swollen foot. As Jamieson aptly noted, in spite of his penchant for narrative consistency, philosophical allusiveness, and literary flair, Guilherme ultimately chose to frame his case presentation as a fragment, thereby augmenting the contrast between the fairy dust of the inflammatory transference and the superglue of its anodyne interpretation. Destabilizing the arc that stretches from the virulent sociality of the transference to the phobically graven image of the interpretation, interrupting the death wish for an interpretive plug, the fragment functions as a partial object of the drive, causing the opening of desire rather than serving as its terminus.The filling of the void with the body of the imaginary wholeness of the corpse is the cruelest satisfaction. Guilherme prefers to withhold this cruelty even if it initially constipates the circuit of desire that pursues the object in banal ways. Handing the fragment over to us, outsourcing the role of analyst, having emptied the seat of analysis of all ghostly ships, Guilherme abandons the fantasy of a private vehicle to celebrate the choral improvisation of a multiply ventriloquized runaway tenor, while synaesthetically sustaining the necessary contingency of the other’s trauma as the temporary tenant of a construction yet to come. What would we make of the phenomena attributed to the patient whose secret seeing this is – her ‘macabre splendor,’ ‘phallic brilliance’ and the ‘anesthesia of her eyes’ so blue, so blind, so wide open? As Chiara noted, blindness is not so much a deficit as it is an excessive desire to see, physiologically manifested in this case as an intraocular pressure leading to the blackout that is the fate of congenital blindness. Considering the tendency of the drive to reverse itself, it’s not surprising that this excessively active scopic drive was complemented by an excessively passive scopic drive, a paradoxical condition that can be seen in extreme cases of visual impairment but also in ordinary cases as the feudal cross-hatchings of a father’s love, a mother’s neglect, and a sister’s envy. An excessive desire to see could easily turn into a fantasy of prophetic clairvoyance, an obsession with final forms, a suicidal love affair with a cadaver, or an apotropaic compensation for an inexorable encounter with an evil eye lodged in a dead socket. Averting the mummified fate of a serial gothic romance where the femme fatale and the corpse become each other, could we settle for a blind woman falling for the voice and touch of a blind man plucked from a supermarket aisle who manages to express the obsessive condition of not being able to stop looking, when seeing is impossible? Could we live with the double paradox of being seen by the one who does not see? Jamieson wondered if this scenario locks the lava of desire back into a compromise formation. Is it too symmetrical to be true, too faithfully mimetically justified, to find a partner who suffers precisely in the way you do? While the trauma of blindness might initially slash the brocade of a feminine masquerade, giving way to a less determined desire, a desire without mood syntonic floral dresses, this opportunity could easily be reabsorbed into the safety of gender jigsaws while abiding by the familiar terms and conditions of a jealousy based economy. Where there was a detumescent phallus, a rickety cane shall come to be. Castration anxiety prevails as a prosthetic phallus is wielded. We remain in a kingdom of metaphorical substitution, unable to imagine the slippage of the phallic horizon. This is not a sublimation so much as it is a recuperation of the transgressive power of trauma back into a safe economy of guilty pleasures. Still, we might concede that some subjective transformation has taken place. Jamieson offers the term ‘good repetition’ to acknowledge a beneficent reconfiguration of the coordinates of desire. Under the aegis of this positively inflected term, we might hypothesize that the tragic cruelty of childhood repeats itself as a structural inversion with a difference – as the tragic happiness of an imperfect domestic partnership. But I wonder if cruelty and happiness are functionally different enough to qualify as the nodes of a good enough repetition, especially when they are cast in the shadow of a tragic predeterminism. Lauren Berlant theorizes this paradoxical conjunction of a hope and torture as a “cruel optimism” that “names a relation of attachment to compromised conditions of possibility.” In other words, optimism is the new face of a stockholm syndrome that employs the living dead and tortures them by forcing them to believe they are really alive. Trigger happy hope kills the dream by thrusting an object onto it. In sadomasochistic solidarity, cruelty and happiness thrive in an atmosphere of a pervasive ghostly melancholia, operating as polarized states of exception, and serving as handy leverage for a duplicitous superego that surrenders the salt of the law to guarantee the eternal lard of a state of security. Another possible inverted repetition might be the neglect of being unseen repeating itself as an inability to see. In the differential between blindness and neglect we find eyes wide shut and an internal deluge swallowed by a volcanic hunger. This inexorable contingency leads to a structural collapse that overtakes the chains of repetition, it is a dead ball beyond the field of paradigmatic and syntagmatic interplay. If it is a repetition at all, it is a repetition that undoes itself. If there is such a thing as good, better, or best repetition, this comes closer than protracted melodramas punctuated with commercial breaks. By theorizing the death drive beyond the hydraulics of the pleasure principle, Freud extricates the principle of repetition from its servitude to a homeostatic machine that never ceases to return to an original state of minimal tension. If we remain within the parameters of the pleasure palace, the urgency of repetition as an engine of begging (re petitio) is tamed beyond recognition, with discharge operating in the service of nostalgia, promulgating an apologia for lostness grounded in the base case of water’s supine obedience to gravity’s unilateral aggressivity. Guilherme’s evocation of an eye socket hungering for the sight of a desiring corpse destabilizes this fantasy of original self-satisfied amorphous plenitude and performs an uncanny disruption of repetition’s utlity as a friendly reminder to reapproximate this zen bliss of yore. Yet if we follow Freud’s lead via Lacan, to expand our understanding of repetition beyond the realm of tepid negotiation, if we consider the petitioning of the drive from the place of an indeterminate cause, or what Lacan calls ‘tuche,’ we open ourselves to a lawless contingency of chance beyond the inertia of the lawful machine modeled after Aristotle’s teleologically motivated ‘automaton.’ Lacan interprets this Aristotelian ‘automaton’ as the momentum of the signifying chain insofar as it is characterized by metonymical insistence, metaphorical persistence, and the constancy of the pulsating drive. Tuche, on the other hand, is the necessary chance that per Mallarme, can never be ‘abolished by a throw of the dice.’ Lacan emphasizes the necessary failure of tuche as the uncaused cause when he states that ‘there is cause only in something that doesn’t work.’ Guilherme supports this ethics whereby determinism is supplanted by the necessary contingency of chance. However he is loathe to fully surrender the affective electromagnetism of his transferential heritage to the empty absolute of indeterminacy, maintaining it as an ambient fog commemorating the ‘imponderable softness’ of a tragicomic hauntological melodrama. For Guilherme, it is from this tenderly timeless fog that the untimely unassimilable chance emerges, to tell the time with obliquely grim humor. I would also like to remain mindful of the trap of negative worship, of eternally memorializing the extreme case as if it were the fountain of youth, an eternal libidinal standing reserve. As Evan noted, structural gaps in seeing are not unique to cases of blindness that manifest at the level of sensory impairment. In the case of blindness, there might be a tendency for the analytic other to fetishize an original ‘undifferentiated palate of images’ that can purportedly be accessed post traumatically. 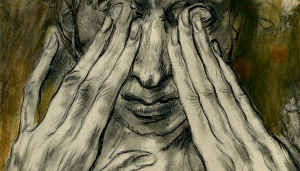 Blindness as a trope of extremity can lend itself to heroic narratives of loss and redemption which occlude structural gaps in subjective constitution, colonizing blind spots with particular kinds of blindness, and reducing desire to a necessary compensation that stands in the place of a necessary contingency. Here we run the risk of a utilitarian appropriation of unconscious desire. The classical position of the psychoanalytic couch, from which the analyst remains unseen, would seem to facilitate the unspoken privilege of an unseen seeing that monopolizes the pixels of the seen. However Guilherme complicates the profundity of his couch by implicating the seeing of many vicarious others in a headlessly choreographed displacement that distributes the gaze in multiple syntactical registers. Guilherme’s variegated fluency in the syntax of seeing keeps him from drowning in the luxurious opacity of a secret in her eyes that exhausts the other as the ‘indispensable fuel’ of its metallurgical front. Instead he is syntactically aware of the secret currency of her eyes, which spends itself as a secretion from her eyes, betraying the esotericism of their secrecy. Refusing the brutal facility of a restorative justice that would pluck an eye to appease a pore, he magnanimously donates the prism of his gaze to sustain the vivacity of a narrative phantasmagoria that never ceases to dream itself to the pulse of a ‘good repetition,’ chorally ventriloquizing the metamorphic demand for love. This leads me to ask, what is a construction? Is It the falling away of the symptom that believes what it sees and sees what it believes, that is trapped in the tautology of knowing itself through ocular testimony? Or is it a kind of poetic justice that turns a blind or blinded or blinding eye towards the imaginary truce of an original mimetic perfection? Is it a justice that forfeits its visual privilege, casting off the injunction to answer to an exterminating glance with the platitude of an unborn desire?